Shakespeare made familiar the names of Macbeth and MacDuff, Duncan and Malcolm; but it is not always remembered that Malcolm married an English princess, Margaret, about 1070. With considerable zeal, Margaret sought to change what she considered to be old-fashioned and careless practices among Scottish clergy. She insisted that the observance of Lent, for example was to begin on Ash Wednesday, rather than on the following Monday, and that the Mass should be celebrated according to the accepted Roman rite of the Church, and not in the barbarous form and language of the time. The Lord’s Day was to be a day when, she said, “we apply ourselves only to prayers.” She argued vigorously, though not always with success, against the exaggerated sense of unworthiness that made many of the pious Scots unwilling to receive Communion regularly. Margaret’s energies were not limited to reformation of formal Church practices. She encouraged the founding of schools, hospitals, and orphanages, and used her influence with King Malcolm to help her improve the quality of life among the isolated Scottish clans. 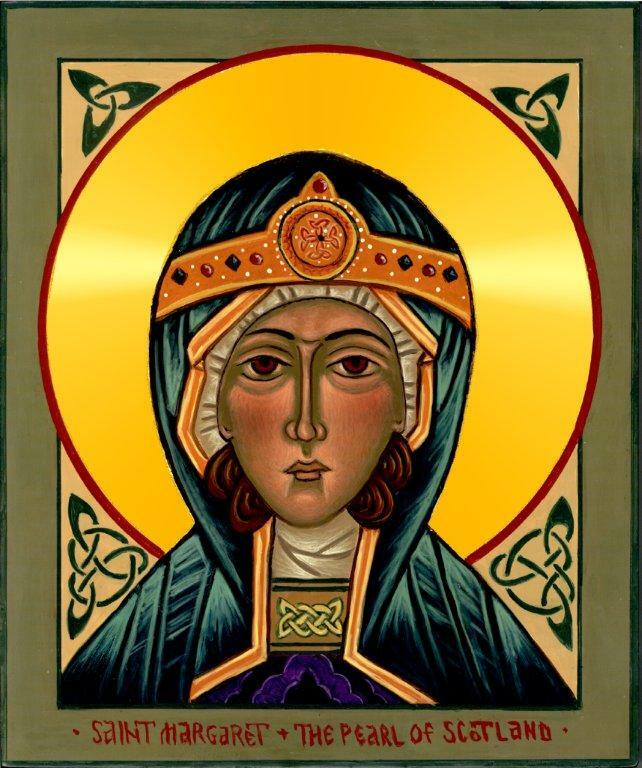 Together, Margaret and her husband rebuilt the monastery of Iona and founded Dunfermline Abbey, under the direction of Benedictine monks. In addition to her zeal for Church and people, Margaret was a conscientious wife and the mother of eight children. Malcolm, a strong-willed man, came to trust her judgment even in matters of State. She saw also the spiritual welfare of her large household, providing servants with opportunity for regular worship and prayer. Margaret was not as successful as she wished to be in creating greater unity in faith and works between her own native England and the Scots. She was unable, for example, to bring an end to the bloody warfare among the highland clans, and after her death in 1093, there was a brief return to the earlier isolation of Scotland from England. Nevertheless, her work among the people, and her reforms in the Church, made her Scotland’s most beloved saint. She died on November 16, and was buried at Dunfermline Abbey.